El Medano has yet to catch up with the modernity of the rest of Tenerife. Despite several developments in the past years, the town has managed to steer clear of that mass tourism feel. Visitors can still smell the authentic Canarian culture lingering in the air, from its friendly people to its quaint local bars. This resort town is perfect for travelers looking for complete R&R that’s hard to find in the neighboring towns. Natural volcanic sands stretching as far as the eyes can see. Million-dollar view of La Montana Roja shimmering in the heat of the haze. Crystal clear waters and waves welcoming sun-tanned surfer and water sports fans. Rustic beach-side bars and restaurants serving a variety of delicious local dishes. All these and more await at El Medano. This eccentric, former fishing village has seen a rapid surge in both development and popularity since the ‘80s. Thanks to its natural windy conditions, the beaches have been the site for many surfing and kitesurfing competitions. These include the renowned World Windsurfing Championship (PWA), which El Medano has hosted five times in a row so far. One will never run out of things to embark on in El Medano. Despite the relaxed ambiance, El Medano offers a plethora of fun activities for visitors of all ages. Soak in the glorious Tenerife sunshine while sipping a cocktail on the beach. Play in the sand or take part in a multitude of water sports and activities. One of the locals’ favorites, Playa El Medano boasts a seemingly endless golden sand and moderate winds. Much to the delight of sunbathers, a small sandy cove cradled by rock formations provides more seclusion. As such, it offers a more peaceful and unobstructed vantage point to watch the nearby kite surfers. 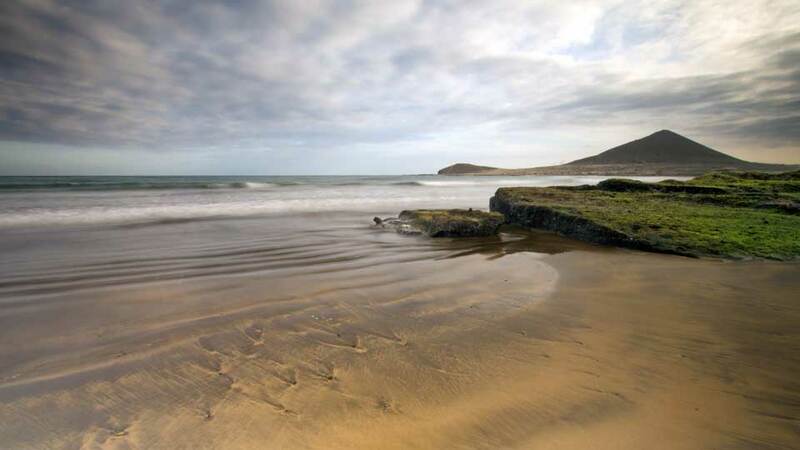 Moreover, Playa El Medano is only a few steps away from Plaza de Principe de Asturia. Beach-goers are free to spend idle hours within easy reach of snacks, drinks, and enticing desserts. Beyond the iconic Montana Roja on the edge of El Medano lies Tenerife’s most famous nudist beach. Playa La Tejita’s pertinent intimacy, in particular on the east side of the beach, makes for a great spot for nudism at peace. Close to the beach is a caravan and tents with showers, a cafeteria, and rental cabins. Although free of mass tourism on most days, it is easy to reach by car, and there are ample parking spaces on both sides. Playa de Leocadio Machado is a nirvana for surfers and kiteboarders. The clean waters of this beach are almost always littered with vibrantly-colored sails, which is an attraction in itself. Lining the boardwalk are shops and outlets providing everything a surfer could need. Located over 2 kilometers from El Medano, Playa Montana Pelada is perfect for those who love pristine beaches and gentle waves. This isolated beach is popular among nudists and younger visitors looking for a relaxed and casual atmosphere. The nearby volcano, Montana Pelada, provides a beautiful and picture-perfect background for this small bay. There is so much more to El Medano than its pristine beaches and high winds. The town is also only a couple of minutes away from the natural reserves. These unique spots are perfect for those who want to have a close encounter with nature. Viewed from a bird’s eye perspective, Montaña Roja looks like a red lozenge of land rising from the ocean. This natural reserve is also known as the Red Mountain and is an excellent example of inorganic sand habitat with wetlands. Here, visitors can feel the fresh ocean breeze and spot some protected bird species. 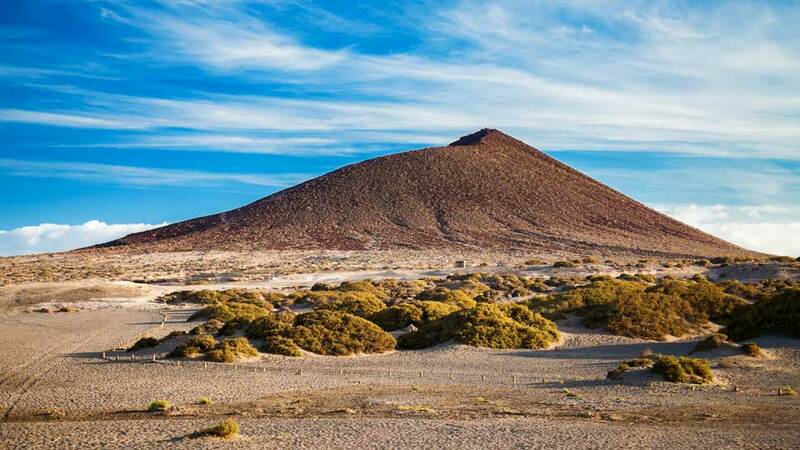 Just a little north of El Medano is Montaña Pelada Natural Monument, fondly known as the Bald Mountain. Although mostly arid with the usual trade winds, it offers a variety of endemic flora. The climb is no walk in the park, especially since the trails are not marked well. Even so, the view from the top is well worth every step. El Medano offers a variety of exceptional surf shops and equipment hire stores. Here, visitors will find an excellent stock of surfboards and swimsuits for men and women of all ages. For bigger stores and larger selections, Playa de Las Americas is just a quick drive away. Bohemian Market is a neo-hippie’s paradise. The market offers everything from handmade pieces of jewelry, colorful clothing to amusing African artifacts. The Canarian Surf Fruit Shop is big on trendy beach wear for surfing enthusiasts out there. Visitors get lost in a range of branded glasses, watches and jewelry by well-known brands such as Dude, Rip Curl, and Oakley. Guests looking to enjoy stylish, laid-back Bohemian bars and chill-out scene will find several choices in El Medano. Flashpoint is a favorite hangout place for surfers who want to enjoy the terrace overlooking the beach. When the sun has set, this breakfast joint turns into an evening bar serving drinks and snacks. Live shows fill the night away and keep the diners entertained while cooling down from the haze of the day. This is a delightful little cafe with a terrace and plays a selection of classic funk and soul music. Guests around in the early afternoon is also rewarded by glorious sunset while enjoying a glass of cocktail or two. There’s no better place to start the evening than in this quaint gastro pub. Chiringuito La Jaquita is a lovely place to sit down with a cold beer in hand while enjoying a beautiful view of the Montana Roja. From luxury 5-star hotels to cozy B&Bs, visitors will surely find a home in any place they choose to crash in. El Medano Hotel is the go-to place for guests visiting the town for the first time. Because of its best-rated location, frequent visitors also opt for this modern hotel. It features an elegant-looking 2-storey sun terrace. It also offers an outdoor pool and rooms with sweeping views of the sea or the pool. Located a few minutes from the El Medano beach, this 3-star hotel is popular among visitors who are looking for convenience. Hotel Playa Sur Tenerife has a lovely sun terrace garden and an outdoor swimming pool. It also offers a sauna and massage service, as well as a business center with free Wi-Fi. The area around the hotel is ideal for water sports, kite surfing, and cycling. This adults-only hotel, set right next to Jaquita Beach, has a well-equipped spa. It also has an outdoor swimming pool and bar that offers fantastic sea views. In the evening, Hotel Arenas del Mar also has a disco with shows and entertainment. Marineda is a lovely complex with swimming pool on the Cabezo coast. 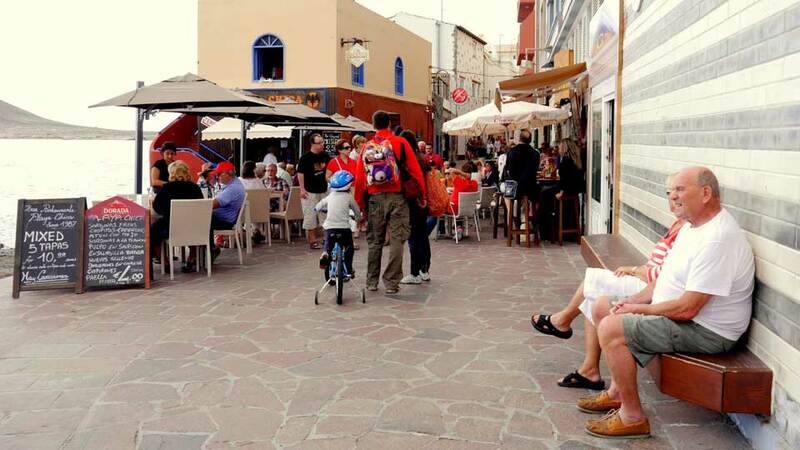 Its proximity to the main beach, square and the cafes makes it a convenient option for visitors. The units are complete with all kinds of amenities guests can need. It’s also has a lounge with wifi and furnished balcony with stunning views over the ocean. One of the best picks in El Medano, Apartamentos Los Delfines, has a great location and amenities. Set in magnificent gardens, with shared heated swimming pool and fully-equipped units, this apartment is truly a home away from home. Casas Bioclimaticas Iter is a complex of modern design villas located only 50 meters from the sea. The complex is surrounded by a wind farm. Its villas boast of natural light while the terraces have a spectacular garden and sea views. All that beach action and outdoor adventures will leave visitors exhausted and famished. The good thing is, they will never run out of options on dining in this vibrant town. Tucked away on a side-street, first-timers often overlook this lovely restaurant. For frequent goers, Familiar is number one on their list for its cozy atmosphere and great food. The restaurant offers Mediterranean, European, and Spanish cuisines. Vegetarian and gluten-free meals are also available. When dining at Len Penon, visitors can expect fabulous food served by knowledgeable staff. The thing that sets this top-notch restaurant from others is their mouthwatering French cuisines. For guests craving for grilled meat and South American cuisines, Restaurante Maracuja is the place to be. The restaurant features nice outdoor seating and a fulls-stacked bar serving wines and beers. El Medano is located on the southeastern coast of Tenerife. The closest airport to the town is Tenerife South Airport, which is 7 kilometers away. The most convenient way of getting from the airport to El Medano is by taking a cab. Visitors may also pre-book a hotel transfer or pick up a hire car from the airport. For a more budget-friendly option, guests may take a bus from the airport. For updated bus lines and timetables, guests may visit www.titsa.com. Getting around El Medano is relatively easier than going to the town. El Medano is small enough to cover everything on foot. El Medano was once an overlooked fishing village in the south of Tenerife. Thanks to its high winds, this small town rose to fame as the windsurfing capital of the island. And yet, despite its popularity, the resort town kept its serene ambiance, which is already an attraction in itself. The town’s beaches are certainly the hub of activity with its mighty ocean waves perfect for many water activities. To find the remnants of its past, including the Plaza, cafes, and restaurants, one will have to go inland from the water sports action. In a nutshell, El Medano offers the perfect blend of tranquility and energy that makes its visitors keep coming back for more.